Perfect finish for any meal. Place egg whites and salt in a large, CLEAN and DRY glass or metal bowl and beat until soft peaks form. *** see FYI below. Gradually add the sugar, a tablespoonful at a time, beating well after each addition. Lightly fold in the vinegar, vanilla and cornstarch. Turn out onto a prepared (greased and floured or covered with parchment paper) and mold the mixture into a large round shape (approx. 9 inches in diameter) and make an indentation in the center. Bake at 250 degrees for 1 1/2 hours or until firm to touch. Shut off oven, and leave door open, cool in the oven. When cool, place on serving plate, fill with whipped cream and decorate with strawberries, sliced kiwi fruit or whatever you chose. If you wish do several layers and fill and stack. If you are a real con artist, you can just buy some meringues at the store and fill them with fresh fruit, whipped cream and lovely little seasonings. 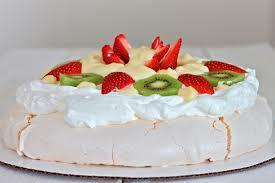 ***FYI: For a crisp white meringue layer is filled with whipped cream and fresh fruit. To keep your meringue from being flat and grainy, try beating egg whites until stiff but not dry. Overbeaten egg whites lose volume and deflate when folded into other ingredients. Also, when beating in sugar, beat in about 1 tablespoon at a time, beating well between each addition. Then beat until meringue is thick, white and glossy. Be absolutely sure not a particle of grease or egg yolk gets into the whites.